The book presents the history of the "Free Indian" volunteers in the German and Italian armies during the Second World War. It is the story of a group of patriotic Indian Nationalist soldiers, who, after volunteering to fight with the British Indian Army after the outbreak of the Second World War, found themselves fighting the Axis forces in the North African Desert. 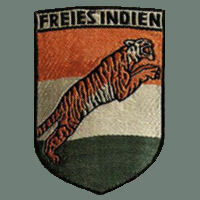 After their capture by Rommel's Afrika Korps, as well as Italian forces, a number of these men were inspired by the charismatic Indian Nationalist leader Subhas Chandra Bose to join a German Army regiment composed of Indians dedicated to the cause of the freedom of India from British colonial rule. Doomed never to fight for their homeland, the Free Indian Legion served as part of the German "Atlantic Wall" garrison until its retreat across France to Germany and eventual surrender in the Austrian Alps. Regarded as traitors by the British authorities for breaking their oaths of allegiance to the British "King-Emperor"; the soldiers of the Free Indian Legion were incarcerated in camps in India before their release in 1946 prior to the independence which they had sought for India.